A 31-year-old African American woman was referred to me for the management of uveitic glaucoma. The patient reported slowly worsening vision and bouts of eye pain with headache and “pressure behind the eyes.” Her past medical history was significant for rheumatoid arthritis, and she had undergone cataract surgery on both eyes. The patient’s medications for both eyes included prednisolone acetate daily, flurbiprofen four times per day, a fixed combination of dorzolamide and timolol twice daily, and brimonidine three times per day. Her systemic medications included pulsed oral prednisone and infliximab infusions for systemic flares. The BCVA was 20/40 OD and 20/20 OS. The IOP measured 38 mm Hg OD and 34 mm Hg OS with applanation tonometry. The pachymetry readings were 514 µm OD and 510 µm OS. A slit-lamp examination of both eyes found 1+ anterior chamber cells, irregular pupils, posterior chamber IOLs, and retained cortical remnants behind the lenses. Gonioscopy demonstrated intermittent peripheral anterior synechiae throughout both angles. A dilated exam revealed a cup-to-disc ratio of 0.8 and 0.4 in the right and left eyes, respectively. Testing with the Humphrey Field Analyzer (Carl Zeiss Meditec) showed a superior visual field defect in the right eye (Figure 1). 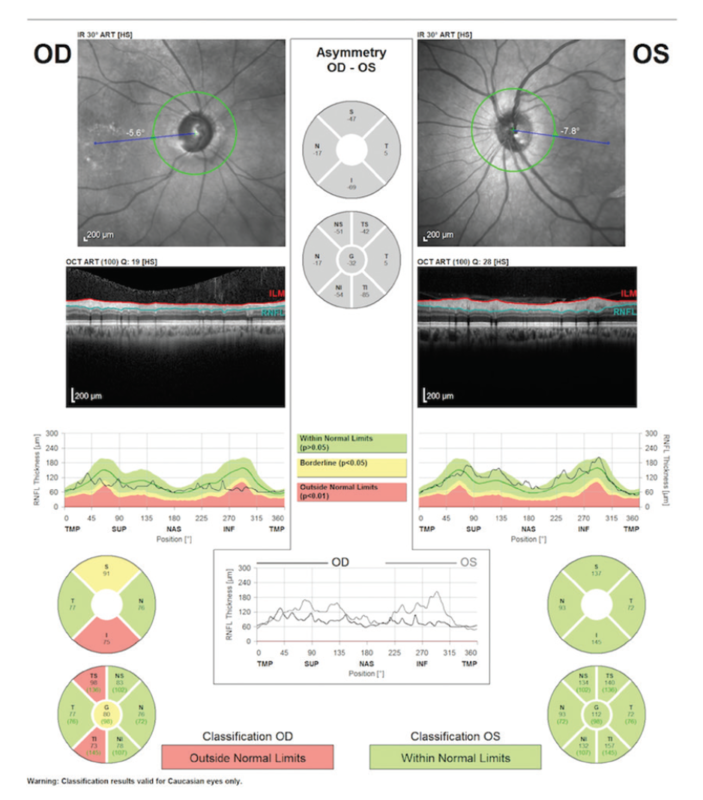 Optical coherence tomography confirmed thinning of the retinal nerve fiber layer inferiorly in the right eye and a normal appearance to the left eye (Figure 2). Figure 1. Humphrey visual field shows a superior defect in the right eye. Figure 2. Optical coherence tomography shows thinning of the retinal nerve fiber layer inferiorly in the right eye. Based on the findings, I considered it imperative to lower the IOP significantly. Because of the active inflammation, I did not prescribe a prostaglandin analogue. Instead, I increased the frequency of prednisolone acetate to four times daily and initiated an oral acetazolamide sequel 500 mg twice daily. After consultation with the patient’s rheumatologist, an infliximab infusion was initiated. At follow-up, the IOP had decreased to the high teens in both eyes with the addition of acetazolamide, and the inflammation had improved but not resolved. After another consultation with the rheumatologist, we agreed that aggressive systemic treatment was needed. The patient was to undergo infusions of infliximab every 3 weeks with oral prednisone 40 mg until the uveitis became quiescent. At follow-up, the inflammation was controlled, but the IOP had risen again, likely from a steroid response. The patient underwent a pars plana vitrectomy with cleanup of residual cortical remnants and the placement of a Baerveldt 250 mm2 (Johnson & Johnson Vision) in the pars plana. Intraoperative steroids were administered, and the patient was maintained on systemic immunosuppression. Once the tube was opened, hypotony developed, and I partially tied off the Baerveldt implant. Although the IOP remained in the high teens with maximal tolerated medical therapy, visual field testing demonstrated glaucomatous progression. At this point, the Trabectome (NeoMedix) became commercially available, and the patient underwent the procedure. She continues to receive monthly infliximab injections but is off systemic steroids. The IOP is well controlled in the low teens with brimonidine tartrate-timolol maleate (Combigan; Allergan) and dorzolamide. The patient is also taking daily bromfenac ophthalmic solution (Prolensa; Bausch + Lomb) as maintenance therapy. Of all the adult glaucomas I treat, I find uveitic glaucoma to be the most challenging. The clinical presentation varies tremendously from deceptively simple, acute, mild anterior chamber cell to an eye that has undergone multiple procedures and is chronically inflamed. Further complicating the picture is the possibility of a steroid response; discerning if IOP elevation is from the primary uveitis or from the secondary treatment can be difficult. • Uveitic glaucoma is challenging to treat, and the clinical presentation varies tremendously. • Medical treatment to control both inflammation and IOP is a reasonable first step. If therapy fails, careful consideration of surgical intervention is warranted, and inflammation control is required for success. • Uveitis and rheumatology colleagues can be of great assistance with these challenging cases. If a patient presents for the first time with uveitic glaucoma, medical treatment to control both the inflammation and IOP is a reasonable first step.1 It is important to keep in mind that herpes simplex virus uveitis can cause significant elevations in IOP. A careful history and exam can help discern if herpes simplex virus is implicated. If so, systemic antiviral therapy can be initiated while topically controlling inflammation and pressure. In patients who develop a steroid response, selective laser trabeculoplasty (SLT) has been shown to be an effective treatment option.2 It is essential to avoid SLT in a patient with active uveitic glaucoma. Only when an acute bout of anterior uveitis has fully resolved and the IOP elevation is clearly caused by a steroid response should SLT be considered. Unfortunately, some patients develop recurrent or chronic uveitis. In these cases, I will initiate a systemic workup if there is no obvious ocular reason for inflammation. Lab testing is focused and based on history and possible exposures. In African Americans, sarcoidosis is a common etiology for systemic inflammation, and once diagnosed, it is important to ask a uveitis or rheumatology colleague to help manage this as a systemic disease. Other systemic etiologies include infection (syphilis and Lyme disease), autoimmune disorders (ankylosing spondylitis, Wegener granulomatosis), and inflammatory disorders (Crohn disease, ulcerative colitis). It is critical to control inflammation as much as possible prior to surgery, because any intraocular manipulation will ignite more inflammation. It is also important to address any ocular causes of inflammation such as retained lens material or malpositioned hardware inciting uveal irritation. Lastly, postoperative inflammatory control is imperative. If the anterior chamber is highly distorted, locating a tube there is likely to cause more uveal irritation, so I will place the tube in the posterior chamber instead. I routinely ask my uveitis or rheumatology colleagues for help with systemic immunosuppression in these particularly difficult cases. Uveitic glaucoma varies extensively in presentation and can be clinically challenging to treat. Medical therapy is the first line, but if control is not achieved, careful consideration of surgical options is warranted. Recurrent or chronic uveitis requires a systemic workup. Clear communication with a uveitis or rheumatology colleague is important for guidance regarding the workup and systemic therapy. Postoperative control of inflammation is critical for surgical success and complication prevention. 1. Sonam B, Vasu K, Usha R, Meenakshi T. Inflammatory glaucoma. Oman J Ophthalmol. 2011;4(1):3-9. 2. Rubin B, Taglienti A, Rothman RF, et al. The effect of selective laser trabeculoplasty on intraocular pressure in patients with intravitreal steroid-induced elevated intraocular pressure. J Glaucoma. 2008;17(4):287-292. 3. Papadaki TG, Zacharopoulos IP, Pasquale LR, et al. 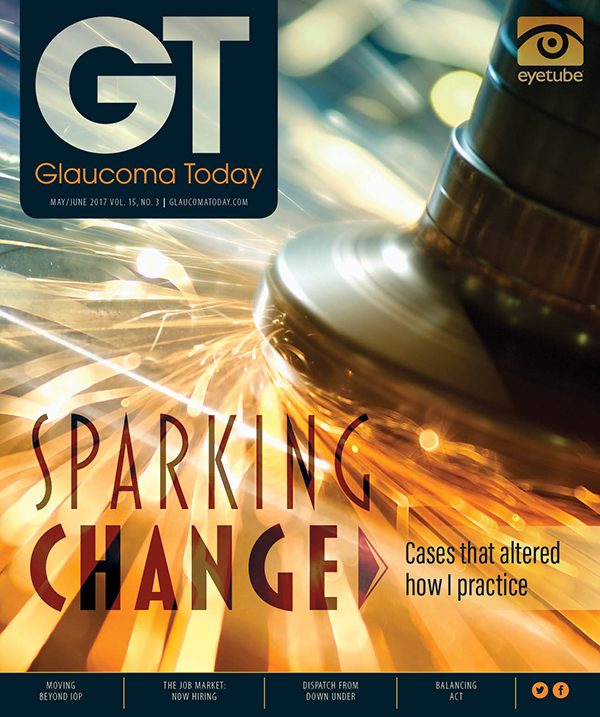 Long-term results of Ahmed Glaucoma Valve implantation for uveitic glaucoma. Am J Ophthalmol. 2007;144:1:62-69. 4. Ceballos EM, Parrish RK 2nd, Schiffman JC. Outcome of Baerveldt glaucoma drainage implants for the treatment of uveitic glaucoma. Ophthalmology. 2002;109:12:2256-2260. 5. Sayed M, Lee R. Current management approaches in uveitic glaucoma. Int Ophthalmol Clin. 2015;55(3):141-160.